Think you have to leave your beloved pooch at home during your summer vacation? Think again! More cities are becoming dog-friendly destinations, offering plenty of activities for both humans and canines. This means outdoor recreation, restaurants where your pup is welcome (and can sometimes even grab a bite, too) and a welcoming place to rest at night. Whether you’re looking for outdoor adventure or relaxing downtime, these five cities deliver bone-afide summer fun. 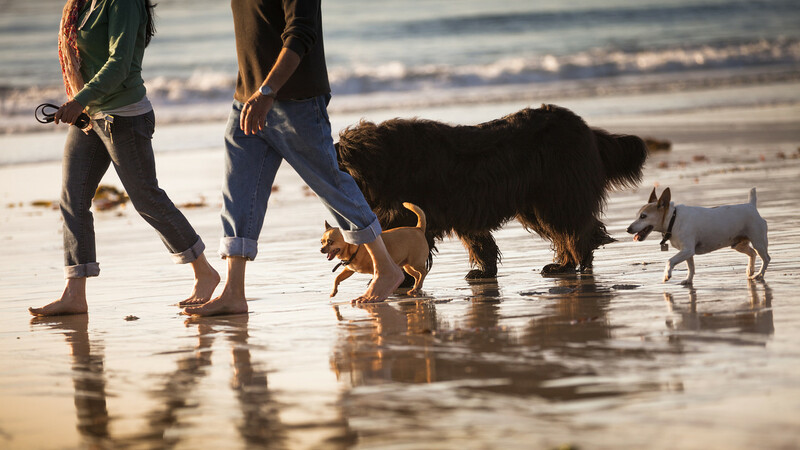 If a sunny western getaway is calling your name this summer, you’re in luck: Carmel has just the beach for you and Fido. Carmel Beach allows well-behaved, leashed dogs to run in the sand and check out the waves. If some shopping is in order after all that sun, you’ll likely stroll past the chic pet boutique Diggidy Dog downtown. Lodging-wise, Carmel has several dog-friendly hotels and bed-and-breakfasts from which to choose. The Lamp Lighter Inn is in downtown and near charming restaurants and shops for you and offers your pup a blanket and plenty of water bowls. Another great option? Edgemere Cottages, which offers private cottages a block from the beach. The city of Minneapolis is known for its natural beauty, thanks in part to the many lakes you and your pup can explore. The Chain of Lakes Regional Park encompasses five lakes and has more than 13 miles of trails so you’re both sure to get a work out in. There are many dog-friendly restaurants in the city once it’s time to replenish. Having dogs in tow usually means patio-only seating, but several city breweries allow dogs inside, including 56 Brewing and Bauhaus Brew Lab. Cheers! Austin temperatures can be scorching — but don’t worry, the city offers plenty of fun ways to cool off in a hurry. A number of the city’s parks have water activities and are dog friendly. Red Bud Isle Park, for instance, allows your dog to be leash-free and explore the trails and water. And Austin’s great food scene isn’t limited to humans — there are tons of great places to grab a bite with your dog. The brilliantly named restaurant Austin Terrier welcomes furry friends on the shaded patio. If your dog is full of energy and won’t sit nicely while you chow down, consider Yard Bar, which is both a restaurant and dog park. The dog park requires a daily pass, but after your pup runs off some energy they can join you for sliders and ice cream. Cape Cod is a popular East Coast vacation destination, and for good reason — the amazing beaches alone are worth the trip. Unfortunately for your dog, most of the popular beaches here don’t allow dogs in the summer. But don’t count it out yet — Provincetown beaches are the exception, though hours vary depending on season. Provincetown is also home to Pilgrim Bark Park, which has two sections for play depending on dog size, and is free to use. Some hotels say they’re dog-friendly but barely tolerate dogs, but that’s not the case here. Simmons Homestead Inn in Hyannis welcomes dogs of any size and understands that sometimes you have to leave Fido in the room alone for a bit — many places will say that’s not allowed. Surfside Hotel & Suites in Provincetown allows dogs to be unattended in rooms, too, and allows dogs on their private beach. If you hate being relegated outdoors when you’re with your pup (alas, those pesky health codes), Key West can help. Several restaurants don’t technically have an indoor space — open-air dining at its finest. Schooner Wharf Bar and BO’s Fish Wagon are just two of your many options. When it comes to activities, think beyond the dog park in Key West (though there’s one of those, too). Instead, consider renting a kayak or paddle board from pet-friendly rental company Lazy Dog or join a dolphin-spotting charter boat with Wild About Dolphins (dog treats and life jackets included!). SUBSCRIBE TO GET POSTS DIRECTLY IN YOUR INBOX!